EDITOR’S NOTE: The following is a guest post from Dr. John Dow, Chief of Regional Growth for Special Olympics International, and President & Managing Director of the Special Olympics Africa region. The whole world mourns the passing of one of the greatest sons not only of Africa, but of the entire world, Nelson ￼Rolihlahla Mandela. ￼There are not enough words to express the impact that he had upon those of us ￼who professed to love freedom, justice and equality for all. I can, however, remind us of the very real and enduring effect that his ongoing ￼support brought to the Special Olympics movement not only in Africa but around ￼the world. 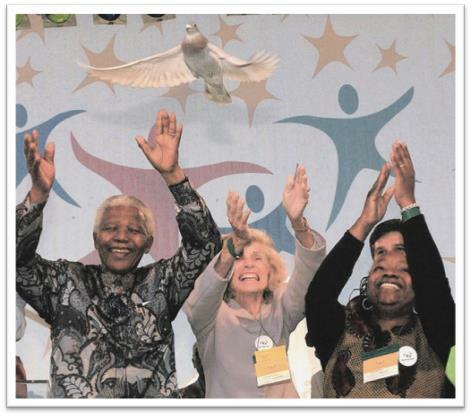 In July of 2001, South Africa hosted “Special Olympics African Hope” and President Mandela was on hand to light the Flame of Hope at Robben Island. The event generated massive awareness for Special Olympics on the African continent and launched a major initiative to reach 100,000 new athletes in Africa by 2005. Today Special Olympics has reached nearly 175,000 athletes in Africa. ￼I am proud to say that his vision was realised in Africa with the hosting of the first ever Special Olympics “Unity Cup” during the 2012 FIFA World Cup in South Africa and the Regional Unity Cup held in 2012.